The Town and Country Wall is a bed with piers including hanging storage. 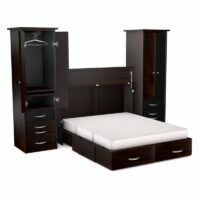 Categories: Bedrooms, Cabinet Beds, Finished Furniture, Premium Cabinet Beds Tags: cabinet bed, cabinet beds, fold out bed, piers, town & country, town and country Brand: Cabinet Bed Inc. 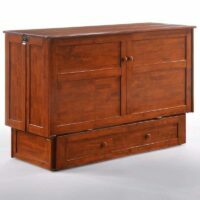 The Town and Country Cabinet Bed Wall with Piers is a complete wall unit. When not in use the wall stores flat. 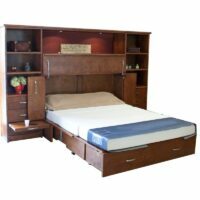 Mount a TV on the lighted back part of the bed. When you’re ready for bed, just unfold the bed and your comfortable nights rest awaits. 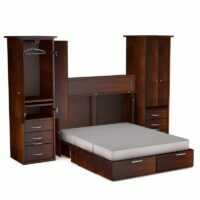 Whether the bed is for you or an occasional guest, this bed is the premium model. 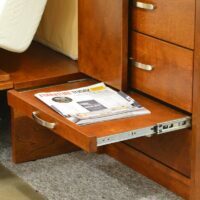 The side piers have 3 storage drawers on full extension glides. Upper doors open to adjustable shelves and a hanging rod to use it as you like. 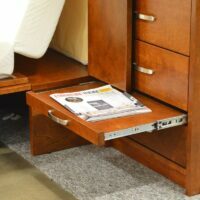 Above the bottom drawer is a pullout tray that makes a perfect nightstand. The Town and Country looks great. 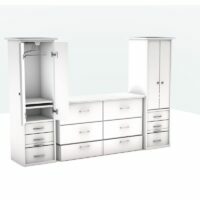 It has a raised panel design on the front, sides, and drawers. It’s simple to use. One person can set up the bed in under 30 seconds. 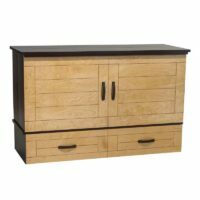 When not in use the cabinet is a great HD TV stand and can support a large flat screen. Use the room as a living room until a guest arrives, no one will know there is a bed in there. 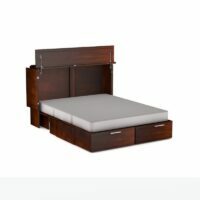 The bed also features a large storage drawer that serves as the foot board. 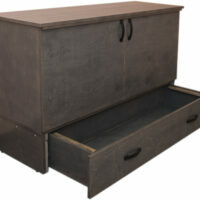 This drawer has plenty of room for blankets, quilts, and pillows. 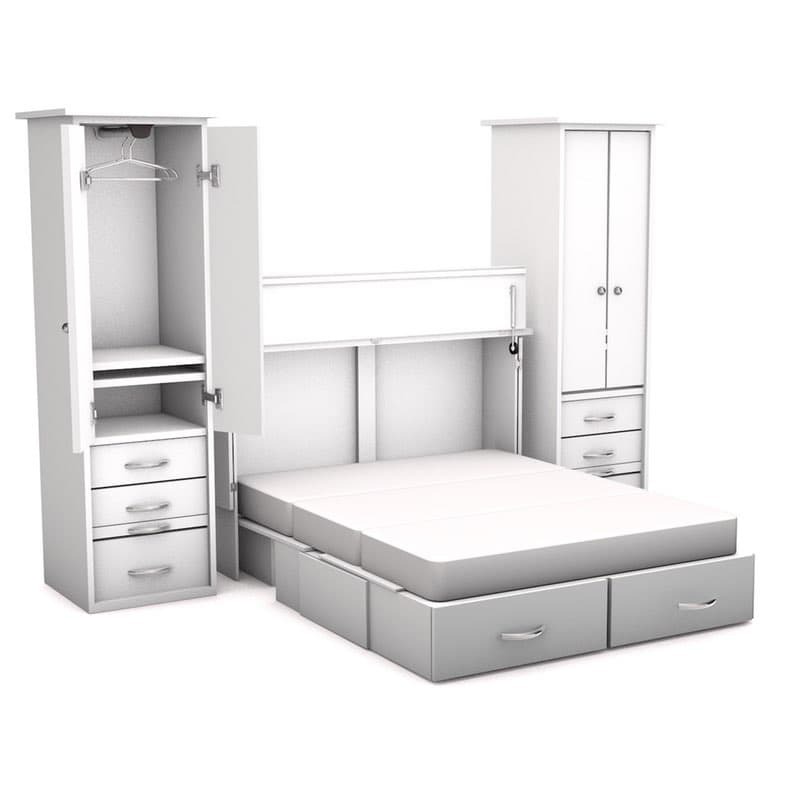 The drawer is accessible while the bed is open or closed. 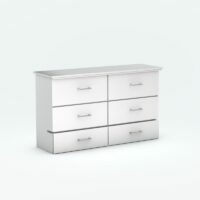 The drawer can support more than 500 pounds. The matching side pier cabinets create a beautiful wall unit complete with a bridge attaching the 2 piers. The bridge includes 2 LED lights with a 3 way dimmer. The side cabinets provide handsome storage. 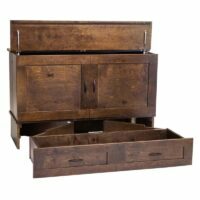 All piers feature three drawers and a handy pull out nightstand. This post includes the upper section doors. Behind the doors are adjustable shelves and a hanging rod. Our memory foam mattresses are certified environmentally safe by CertiPur-US. Every mattress features a machine washable, removable bamboo cover. 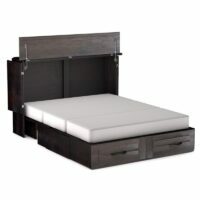 The memory foam mattress features a cool gel top and is very comfortable. 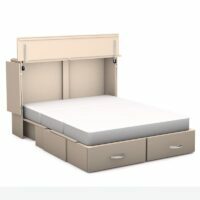 It’s a tri-fold mattress, designed specially for cabinet beds. 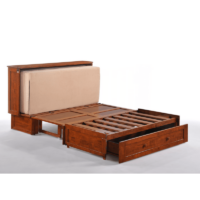 Town and Country beds are made in Vancouver, Canada from real wood and plywood. We believe that plywood construction is strongest and most stable. Plywood is made of multiple layers glued together perpendicular to each other which maximizes the strength. 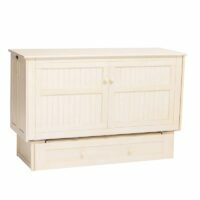 The Town and Country contains no toxic or environmentally harmful MDF or particleboard. 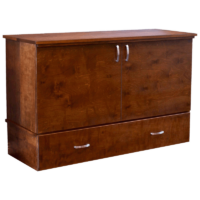 Only Canadian and American Lumber is used the making of our cabinet beds. 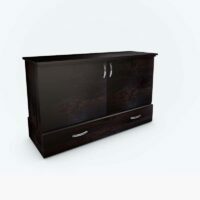 Plywood cabinet beds are also the longest lasting construction because the screws that hold up your door hinges and drawer tracks are securely anchored and won’t loosen or strip.